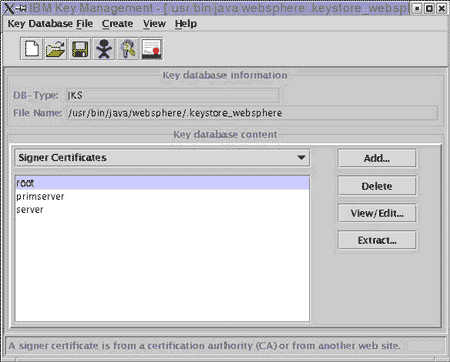 Before being able to enable SSL on WebSphere, you need to have your own certificate. This certificate can be a self-certificate for testing purpose but in any production case, you should have a certificate issued by a Trusted CA. The following steps describe how to get your own certificate and later how to configure WebSphere to use it. Click on the Add button. A dialog box will appear where you have to enter the data, the Certificate file name (the certificate file you received) and its location. Once all of this information is entered click on OK.
Once you've selected 'Personal Certificates', please click on the 'Receive' button. A dialog box will appear in which you must enter the data required, the certificate file name (the certificate file you received) and its location. Once all of this information is entered click 'OK'. This will configure your keystore correctly. 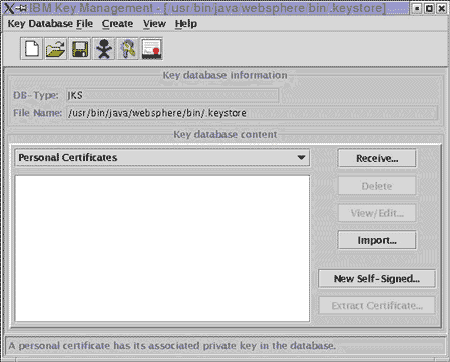 Once your keystore has been successfully configured with your certificate, you can enable SSL in WebSphere Application Server.